The Canadian Campion Explorer 622i's popularity in New Zealand is reflected by more than 30 sales since it was first introduced in 1996. The latest version of the boat - diesel-powered - arrived recently and it's already attracting plenty of interest. Lawrence Schaffler reports. 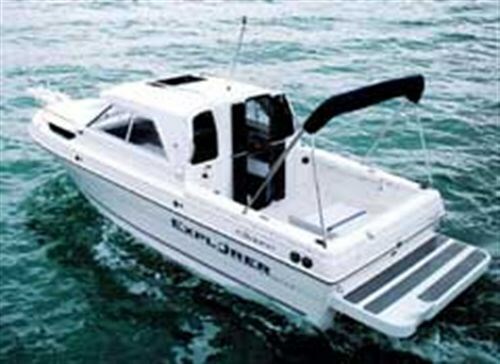 The traditional Explorer 622i (6.2 metres) is distributed in New Zealand by Sports Marine exclusively and is available in two models - the Sedan (with an enclosed cockpit) and the Walkaround (open, narrower cockpit). The Sedan, says salesman Nick Webley, is the more popular, and it's not difficult to see why. It's a trailer boat, but it's effectively a small launch. 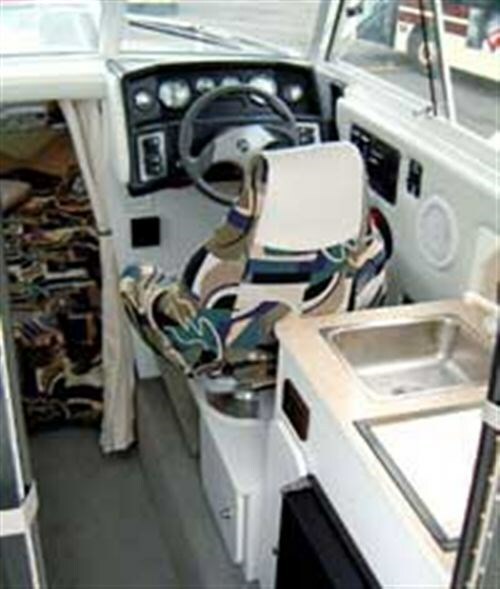 With its hardtop and enclosed cockpit, it's fitted with shore power, sink, fridge and a single plate burner. There's a very generous V-berth, plenty of storage, and even space for a chemical toilet. 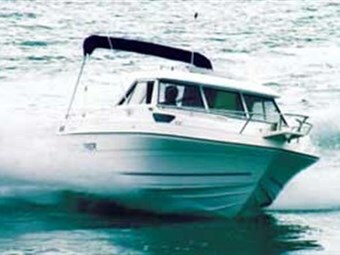 All in all, a very comfortable family boat that makes spending a few days away a very attractive proposition. To date, the 622i has been fitted with a 220hp, V6 petrol inboard-outboard Mercury. The new diesel version (four cylinder, 1700 cc, 120hp) is the first in the country, and also uses a Mercury power plant. If Sports Marine's market research is anything to go by, it should be an even more popular seller. "We ordered a 622i-D," says manager Frank Atkinson, " purely on the strength of the queries we kept getting for a diesel-powered version of the Sedan." He believes two main factors are behind the queries. "Fuel accessibility is the major one. As a mini-launch, people are likely to want to spend a few nights in the boat, and as they venture further from the main marinas, petrol availability drops off. By contrast, the small, remote jetties usually carry diesel." Diesel's cheaper cost and efficiency is the other issue. "At 120hp, this engine is less powerful than the V6 petrol plant, but it still offers plenty of performance. The typical buyer of the 622i is interested in space and comfort for the family. It's not a speed issue." There is certainly no sense of a lagging performance from the diesel engine. It responds smartly to the throttle, gets the boat up on the plane very quickly, and at 4,600rpm, pushes it along at a shade over 30knots. The enclosed cabin and the insulated engine compartment offer a remarkably quiet ride, and the power- assisted steering makes helming a breeze. Perhaps the best feature of the motor, however - and it's an unexpected bonus - is the lack of diesel exhaust fumes. Unlike conventional diesel launches that exhaust through pipes above or at water level, the Mercury engine exhausts underwater, through the prop - just like its petrol cousin. There is no smell - even when running downwind. For those who have to fight against tinges of sea-sickness, or for fishermen trolling at slow speed, that means clean, fresh air. So what's the Sedan like? As existing owners will affirm, it's a large-volume boat with plenty of space - designed for the family - yet all fitted into a very sleek hull. It has range, equipment and performance - good incentives for embarking on a real cruise. 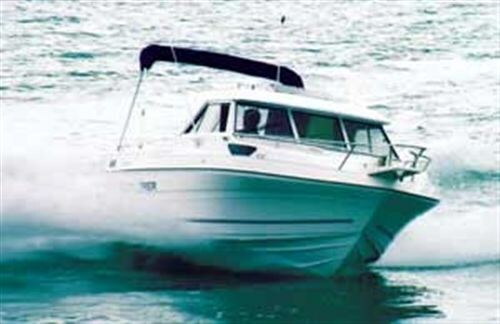 It is the ideal package for drifting around the Marlborough Sounds or the Bay of Islands for a few days. Inside, the forward section of the boat is dominated by a large V-berth, equipped with two bulkhead-mounted reading lights and a wide "surround" shelf, port and starboard. A hinged mirror on the bulkhead lifts to provide access to the anchor locker. There's plenty of storage under the V-berth, and room in the centre section for a chemical toilet (fitted as an optional extra). A tough, scotch-guarded draylon is used for the upholstery, and complements carpeted walls and ceiling. Access to the foredeck is through a large hatch. The business end of the enclosed cockpit (constructed from powder-coated aluminum) has a fully-upholstered pedestal seat facing a conventional array of instruments, and a selection of switches within easy reach. They control the horn, wiper, bilge pump, cabin lights, navigation lights, as well as the Simpson-Lawrence windlass. Above the throttle is a LED display panel for the trim tabs - the position of each tab can be seen at a glance and instantly adjusted. Thanks to surround windows (sliding windows on the sides), the helm position offers great visibility all around the boat, and a windshield wiper is fitted to the driver's pane to cater for rainy/windy days. More storage space is behind the helm station, as well as the single-plate, butane burner, the sink (with fresh-water tap) and battery-powered fridge. Upholstered seats and more storage (under squabs) make up the port configuration. Entry into the cabin is through a "door" rather than a "hatch", and as it's almost full-length: hardly any stooping is required. Perhaps the most surprising feature of the cabin is the amount of headroom - 1.95m. Turn up the waterproof Clarion CD stereo system, and you can bop till you drop. And if things get too sweaty, you can open the sunroof. Aft of the cabin is the open cockpit area with a vinyl upholstered engine cover in the centre. Fittings include standard features such as rod holders, cup holders, removable seats, storage lockers and a seawater hose for washing down. The engine cover hinges forward, providing generous access for checking oil, replacing filters and tightening V-belts. Two features are particularly clever: two fish bins are fitted into the floor (port and starboard) and they have moulded liners that are easily removed for washing. The other is the short ladder that provides access to the cabin roof and the foredeck. The ladder unclips and is designed to be attached to the dive platform, where it becomes a boarding ladder. Should you prefer to extend the enclosed area, the Bimini unfolds and clips on to the cabin roof in front, with a backdrop clipping onto the stern. Very cosy. Access to an expansive foredeck is through the hatch above the V-berth, or up the ladder and around the cabin. Stainless steel grab rails are mounted on the cabin roof to help you negotiate the route around the side. The foredeck is surrounded by stainless steel stanchions and a grab rail. Up front, the electric windlass is equipped with a Danforth anchor, 10 metres of chain and 40 metres of rope. Campion exports the boat with a galvanised trailer. Atkinson says the boat is also available with a locally manufactured, GT unit. The latter is more expensive, but unlike the Canadian trailer, features disc brakes. In the final analysis, the Explorer Sedan should make any keen boatie's life a lot easier. It's a lot of boat, yet it's easily towed. The diesel motor offers lower running costs, better accessibility to fuel, and the opportunity to slip away for a few nights at a time, rather than a few hours. Best of all, with a toilet, a fridge, fresh water and a cooker, it's a boat even your wife will like.